Journey Business Solutions is a business that helps other small- to medium- sized companies throughout the Fort Worth and Dallas area. No matter what type of business you are, if you need assistance with payroll services or merchant ones, we can help. Our merchant and payroll services are geared toward helping you as a business excel and become exactly what you dreamed you could be. We are in the business of helping you achieve your dreams for your service or product. We understand the struggle of being a small business, which is why we strive to help businesses that are dealing with finding their footing. Whether you’re a small business that’s been around for years or a startup, our merchant services are here to take some of the responsibility off of your plate. For further information about Journey Business Solutions, contact us. What Types Of Businesses Need Merchant Services? Now that you know what Journey Business Solutions can do, let’s focus on the question we’ll be answering in today’s blog: Who needs merchant services? What types of business need merchant services? How do you know if you need merchant services? 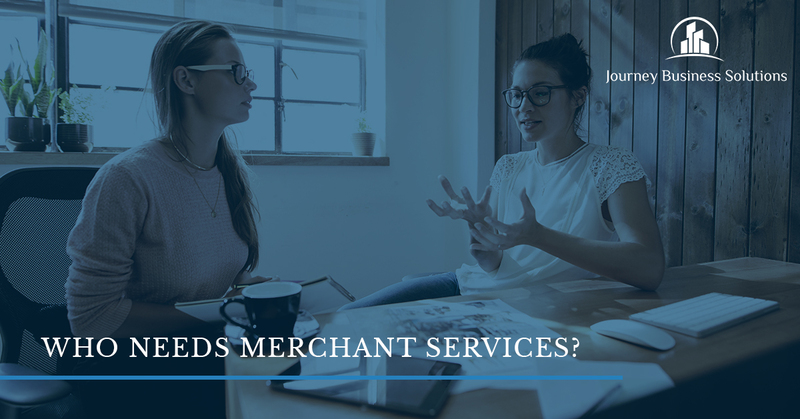 Answering this question is pretty simple if you’re any type of business because merchant services are for any company that is offering something to purchase whether that be a service or a product. Our payroll services are for any type of business — we help make paying your employees much easier. Our merchant services are geared toward making your life a little simpler because we have resources and products to make purchasing your items or services more efficient. We offer credit card acceptance and technology such as Pay Pro Tec. Circling back to our original question, the answer is that if you’re a business, then our merchant services will provide you with an efficient solution to customers making purchases and you receiving the profits. When you decide on our merchant services, you can expect to use reliable payment solutions for your customers. These reliable payment solutions offer your customers a safe way to pay for your products or your services. The total merchant services will offer a secure payment method, so your customers never have to worry about their information getting stolen. In addition, your customers will be able to use any form of payment they want to pay for your products or services. Our merchant services won’t limit you to one type of payment, but rather will give your customers the option of paying with a credit card, check, debit card, or cash. By offering secure payment options and a variety of ways to pay, your customers will feel more comfortable by knowing that you’re a reliable place to do business with. Merchant services matter because you need a way for your customers to purchase your services or products. Without merchant services, your customers won’t have a way to make a transaction and you’ll be unable to receive it. This method is best for any type of business that wants to pay with a credit card or cash. If you only offer one way to pay, then you’ll be isolating a large group of people who may prefer to pay with credit cards only or with cash. Merchant services matter because they offer you an easier way to keep track of your business transactions as well. You won’t have to worry about inventory or online payments because you have the popular merchant services that offer a solution to how customers will purchase your services or goods. Why Does Business Need Merchant Services? Common merchant services aren’t only about credit card acceptance. We also offer methods for online payments for online stores or brick and mortar stores that have an online presence. With so many options out there, it’s vital that you make paying online and in your store as easy as possible. After all, you don’t want to turn away a customer because you can’t accept their form of payment. Do you have questions about merchant services? Contact us today to learn more about our processes, resources, and products.